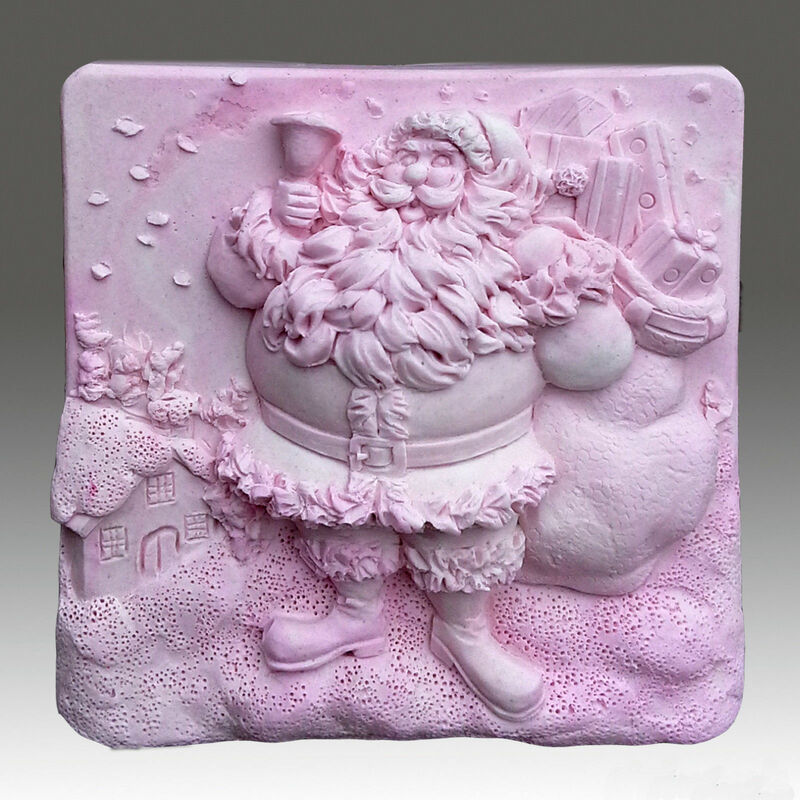 Jolly Jolly Santa - Detail of high relief sculpture, silicone Soap/polymer/clay mold, soap mold, silicone mold Ho Ho Ho Santa will be on his way soon! this wonderful design will make fabulous and fun Christmas Soaps. Size(inch): 3" * 3" * 1 3/10" Size (cm): 7.7 * 7.6 * 3.3 MP soap : 174 grams / 6.21 oz. per bar CP/HP soap: 164 grams / 5.86 oz. per bar Please note: The photo shows a finished soap made with the silicone mold described above. The above soap weight is for reference only. Different soap quality would weight different. One cavity / per mold Please note: Soapmaking Tips: MP soapmaking is easier than making CP/HP soap. You can use alcohol to help release bubbles that may form in the soap. To make CP or HP soap, please make sure the hardness of your soap formula. It would help to make sure to take out a perfect soap. Customer Note: Dear International Friends, Egbhouse is a Taiwanese-American company based in Taiwan with American investors and affiliate offices. All egbhouse products are made exclusively in Taiwan. Please note that egbhouse uses absolutely NO products or materials of any kind from China. For further inquiries, please check with our office in Chicago. Product Features Molds are shiny and non greasy. High durability and flexibility. Easy to use. Easy to clean. The consistency of GBhouse silicone is superior to that of other molds in the market; stored properly the mold will hold its shape for years Order Manufacturing *All soap/candle molds are custom-made by hand to insure the highest quality. *We now need about 5 business days to complete every single order. *If you need more assistance to calculate the total manufacturing and shipping time, please feel free to contact us. Shipping Fee and Handling Time - *Please kindly understand that all products are shipped directly from Taiwan, which is an island in the Pacific Ocean close to Japan, China and Korea. *Shipping charges depend on the weight of the order. *GBhouse ships using the Taiwan Postal System. *We don't make or try to make profit from the shipping fees. Paypal charges us 3% on all shipping fees and we absorb those charges. *Please kindly note that your order is an international shipment. Once completed, your order will take 7-11 business days to arrive. *To check on your order, contact us via . *The total time for manufacturing and shipping may be 3 weeks or slightly longer. When you leave feedback, please be kind and understanding about these points. Thank you so much, dear buyers! We truly appreciate your wonderful support in growing our business to more than 30 countries. Thank you for visiting ! Golden Bright, 2008, All rights reserved Powered by Turbo Lister The free listing tool. List your items fast and easy and manage your active items.